It goes against the economic rationale to assume that commercial search engines have the best interests of users at heart when it comes to data protection and use. Sys admin Charly has found an alternative. Many Linux tools with low version numbers seem astonishingly mature and stable – and they are. Searx , which recently bounced up to 0.10.0, is definitely one of them. The developers describe it as "a privacy-respecting, hackable meta search engine." If you enter one or multiple search terms in the search box, Searx forwards the request to up to 70 online sources. The results show you the sources from which they originate. You can individually sort the sources by topic or disable them, if needed. In the General field, you will find the major players: Google, Bing, DuckDuckGo, Yahoo, Wikipedia, and Reddit. For images, the results come from 500px, Flickr, or Deviant Art. If you are looking for music, the program taps into Deezer, Google Play Music, Spotify, SoundCloud, or half a dozen Torrent sites. IT gives you GitHub, Stack Overflow, and the excellent Arch Linux Wiki. The Science category may be quite thinly populated, but it has some jewels in the form of Wolfram Alpha, Google Scholar, and Microsoft Academic. Base (the "Bielefeld Academic Search Engine) specializes in searching for and within scientific work. For example, a quick query for "adenosine triphosphate" provides three times more hits than a Google science search on scholar.google.com. If you like, you can prioritize results from open access sources. 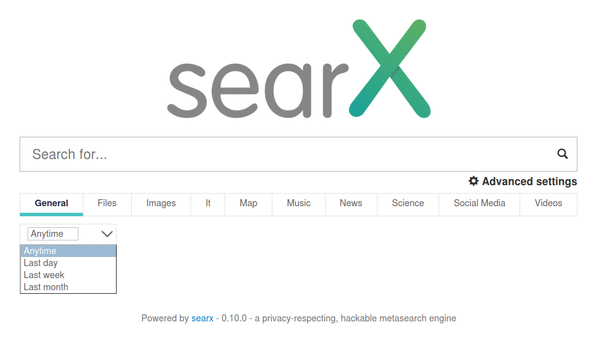 Searx also loads more hits when you scroll through the results. What's new in the current version is the ability to restrict the search to a specified time period (Figure 1). The developers are particularly proud of the fact that their tracker dog handles the user data with care. The Python source code is open, and Searx does not store user profiles. By default, Searx does not even store cookies. That only happens if you change settings and save the changes. Figure 1: The latest version of Searx, which stands out because of its good data protection, can also restrict results to a specific period of time. A couple of dozen Searx instances  worldwide are available for global use by everyone. The development team itself also runs an instance . And, if you don't trust external services, you can simply build your own Searx server. Minimal hardware such as a Raspberry Pi is sufficient for this, and there is a how-to online . There is no escaping the facts: Searx is amazingly mature for version 0.10.0. Having a good backup is a matter of course for sys admin columnist Charly Kühnast, but devices could still fall victim to fire or theft some day. Because he has enough free space on Google Drive, he doesn't need to search long for a solution. The only thing missing is the right tool. This month, Charly Kühnast draws attention to a widely unknown weather phenomenon: The instability of rarely used tunnels leading to a Raspberry Pi. Read on for greater insights. Sys admin columnist Charly Kühnast has an electronic note box in which he collects ideas and small snippets of code. He calls it his "quarry" and is taking this opportunity to offer up some collectors' items to regular readers. Whenever you really need documentation, it's almost always incomplete or outdated – or both. Sys admin columnist Charly K¸hnast recommends a radically different approach: the universal community documentation cheat.sh, which no Linux command and hardly any programming language should do without. In this issue, sys admin columnist and tool veterinarian Charly Kühnast invites Sysdig, the jack-of-all-trades among system diagnostic tools, into his surgery for a quick checkup. The project promises to unite the functionality of lsof, iftop, netstat, tcpdump, and others.